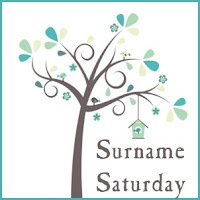 This week's Surname Saturday post is going to feature the Bigham name in my family tree. 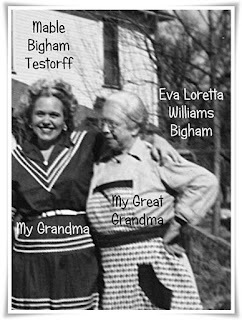 The Bighams are in my paternal line, which has its most recent beginnings in my tree with my grandmother, Mable Louise Bigham. Mable was born on September 18, 1921 in Oswego, Labette County, Kansas. 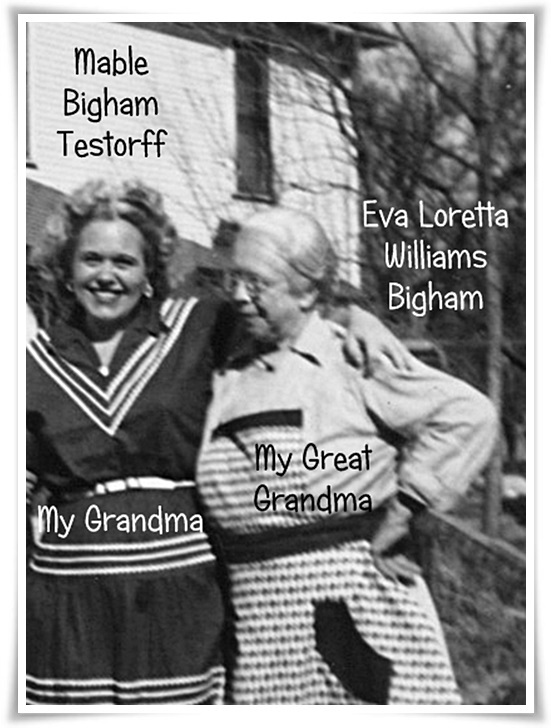 Her parents were Turence Stanley Bigham and Eva Loretta (Williams) Bigham. In the photo below, you can see my grandmother with her mother, Eva. This next photo is of my great grandparents, Turence and Eva Bigham. Great Grandpa Turence was born on December 20, 1890 in Labette County, Kansas. He would live his whole life in Kansas, until May 16, 1968, when he passed away at the age of 77. Great Grandma Eva passed before him, at age 73, on October 15, 1965, in Oswego. Turence was the son of Aaron Bigham and Mary Ellen (Crain) Bigham. Aaron was born December 21, 1855 in Washington County, Illinois. Mary Ellen was born October 24, 1867, also in Illinois. 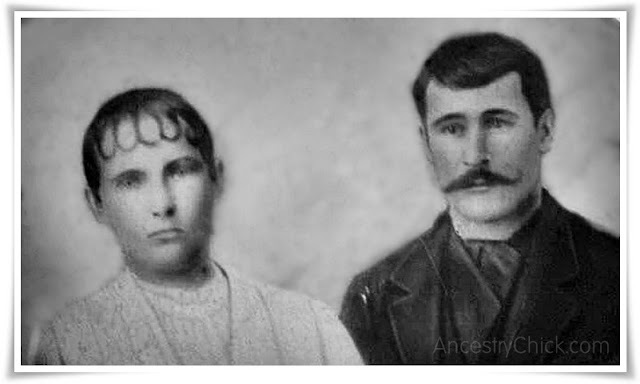 My great-great grandparents would have 7 children, 6 who survived. They also would live most of their married lives in Labette County, Kansas. They are pictured in the photo below. Aaron's father was John Bigham, born in Ohio on July 20, 1828. John's father was James William Bigham, born 1784 somewhere (as yet unknown) in Ireland. 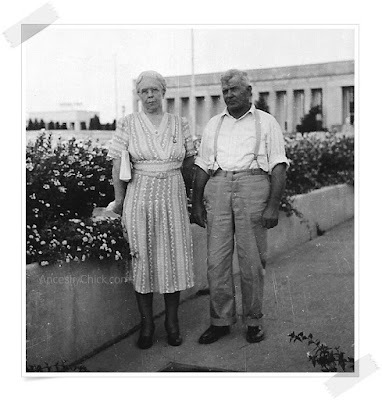 He and his wife, Elizabeth (McCreary) Bigham (who was born in Pennsylvania) would live many years in Guernsey County, Ohio, and then Washington County, Illinois. James Bigham's father was William Bigham, born somewhere in Ireland in 1760. He and his wife, Sarah Barton (also born in Ireland) would have at least five children and and live for many years in Guernsey County, Ohio. They are both buried in Old Washington Cemetery there. 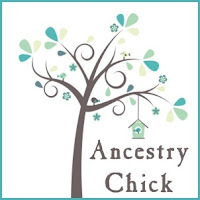 That is as far back in my family tree as I have gotten for my Bigham ancestors. All I really know of the Bigham surname is that it is a Scottish habitational name from a placed called Bigholm(e). The main parts of the name are the Old Norse "big" from "bygg," meaning "barley" or the Old Danish personal byname Bekki, large or stout; plus the Old Danish "holm," a small island or piece of land surrounded by streams. So it's seems likely that somewhere far back in the Bigham line, even though I have much Irish Bigham ancestry, there may be a Scottish Bigham ancestor somewhere that I haven't yet uncovered. Hopefully one day I'll dig up those Scottish Bigham roots.